Everyone you refer gets $10 in credit. Once they’ve spent $25 with us, you’ll get $25. There is no limit to the amount of credit you can earn through referrals. All the Plans of DigitalOcean.com include DNS management, Private networking, Solid State Drives, Global image transfer, 99.99% up time. You can select location based on latency or Spin up a droplet across regions for high availability. DigitalOcean offers two kind of pricing models. First is Monthly and 2nd is Hourly. Most popular plan is $10 per month which includes 1GB memory, 1 Core processor, 30GB SSD disk and 2TB transfer. You can buy additional bandwidth at the price of 2¢ per GB. Their hourly plan start from $0.007 per hour and if you want very high volume plans then you can contact their software engineer. Mostly you will find Digital Ocean Coupon Codes for $10 Free credit and sometime they also release $20 credit codes. With the $10 Free Account credit you will get whole 2 month of VPS server for FREE. It is important to note that, You will be allowed to use only 1 offer code per account. If you have personal blog with limited traffic, I would suggest you to buy $5 per month plan and if you have for small business website then you can go for $10 or even higher plan. 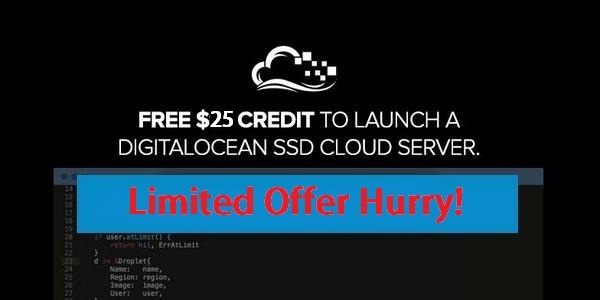 Promo Codes for Digital Ocean are subjected to expire, So please use them before they disappear. I usually update the page with most recent offers, coupons and deals, So keep checking us and don’t forget to provide your valuable feedback by commenting here.